Big Brother rewarded the Big Brother Naija 2018 housemates after Miracle's win in last night's PayPorte arena challenge. Thanks to the liquid courage Biggie awarded the Housemates post-arena games, it got lit. Miracle’s win might have been a reason to celebrate for him and his, but his counterparts couldn’t have been happy with his last minute victory. His sudden championing mimicked Lolu’s win last week. While everyone thought the game had ended and could have sworn Miracle had banked the Million, Lolu came, raced and conquered the million. Nina, Tobi and Alex were unsurprisingly the most excited about Miracle’s win. As per norm, Big Brother rewarded the Housemates with a few bottles of liquid courage and had the House buzzing with celebratory wails. While the ladies negotiated their bath prices and prepared themselves for good wash ups, the guys popped bottles and gulped away at their courage. Thanks to their very intense closet conversation, Anto and Lolu seemed to have found their ‘good’ place as she voluntarily massaged his head and judging by the way he sweetly declared her his girl, Lolu couldn’t have been in better hands. This sudden turn of events had Tobi questioning Anto’s motives and trying to find out what was going on because just a night ago, Anto seemed cosy beside him while Lolu found solace in the bath tub. 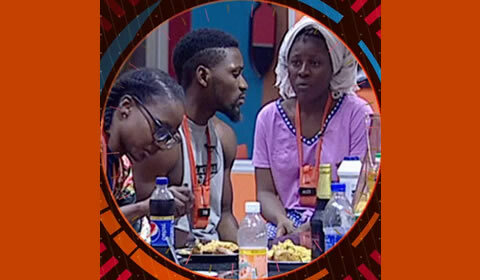 Khloe caught on to the narrative and offered her unsolicited advice, reminding Tobi just how much Cee-C was into him, in case he’d forgotten. When everyone was mud free and ready, the Housemates gathered in the kitchen and had a mini feast and enjoyed a game of beer pong. With Khloe’s broken bars for entertainments, the Housemates had a long night ahead of them.